An integrated circuit or monolithic integrated circuit (also referred to as an IC, a chip, or a microchip) is a set of electronic circuits on one small flat piece (or "chip") of semiconductor material that is normally silicon. The integration of large numbers of tiny transistors into a small chip results in circuits that are orders of magnitude smaller, faster, and less expensive than those constructed of discrete electronic components. The IC's mass production capability, reliability, and building-block approach to circuit design has ensured the rapid adoption of standardized ICs in place of designs using discrete transistors. ICs are now used in virtually all electronic equipment and have revolutionized the world of electronics. Computers, mobile phones, and other digital home appliances are now inextricable parts of the structure of modern societies, made possible by the small size and low cost of ICs. Integrated circuits were made practical by mid-20th-century technology advancements in semiconductor device fabrication. Since their origins in the 1960s, the size, speed, and capacity of chips have progressed enormously, driven by technical advances that fit more and more transistors on chips of the same size – a modern chip may have many billions of transistors in an area the size of a human fingernail. These advances, roughly following Moore's law, make computer chips of today possess millions of times the capacity and thousands of times the speed of the computer chips of the early 1970s. Half a year after Kilby, Robert Noyce at Fairchild Semiconductor developed a new variety of integrated circuit, more practical than Kilby's implementation. Noyce's design was made of silicon, whereas Kilby's chip was made of germanium. Noyce credited Kurt Lehovec of Sprague Electric for the principle of p–n junction isolation, a key concept behind the IC. This isolation allows each transistor to operate independently despite being part of the same piece of silicon. 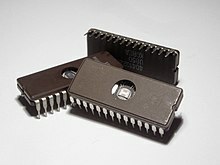 Fairchild Semiconductor was also home of the first silicon-gate IC technology with self-aligned gates, the basis of all modern CMOS integrated circuits. The technology was developed by Italian physicist Federico Faggin in 1968. In 1970, he joined Intel in order to develop the first single-chip central processing unit (CPU) microprocessor, the Intel 4004, for which he received the National Medal of Technology and Innovation in 2010. The 4004 was designed by Busicom's Masatoshi Shima and Intel's Ted Hoff in 1969, but it was Faggin's improved design in 1970 that made it a reality. Advances in IC technology, primarily smaller features and larger chips, have allowed the number of transistors in an integrated circuit to double every two years, a trend known as Moore's law. This increased capacity has been used to decrease cost and increase functionality. In general, as the feature size shrinks, almost every aspect of an IC's operation improves. The cost per transistor and the switching power consumption per transistor goes down, while the memory capacity and speed go up, through the relationships defined by Dennard scaling. Because speed, capacity, and power consumption gains are apparent to the end user, there is fierce competition among the manufacturers to use finer geometries. Over the years, transistor sizes have decreased from 10s of microns in the early 1970s to 10 nanometers in 2017  with a corresponding million-fold increase in transistors per unit area. As of 2016, typical chip areas range from a few square millimeters to around 600 mm2, with up to 25 million transistors per mm2. The expected shrinking of feature sizes and the needed progress in related areas was forecast for many years by the International Technology Roadmap for Semiconductors (ITRS). The final ITRS was issued in 2016, and it is being replaced by the International Roadmap for Devices and Systems. Initially, ICs were strictly electronic devices. The success of ICs has led to the integration of other technologies, in an attempt to obtain the same advantages of small size and low cost. These technologies include mechanical devices, optics, and sensors. 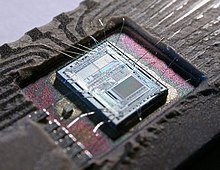 Since the early 2000s, the integration of optical functionality (optical computing) into silicon chips has been actively pursued in both academic research and in industry resulting in the successful commercialization of silicon based integrated optical transceivers combining optical devices (modulators, detectors, routing) with CMOS based electronics. Integrated optical circuits are also being developed, using the emerging field of physics known as photonics. various approaches to stacking several layers of transistors to make a three-dimensional integrated circuit (3DIC), such as through-silicon via, "monolithic 3D", stacked wire bonding, and other methodologies. The cost of designing and developing a complex integrated circuit is quite high, normally in the multiple tens of millions of dollars. Therefore, it only makes economic sense to produce integrated circuit products with high production volume, so the non-recurring engineering (NRE) costs are spread across typically millions of production units. Integrated circuits can be classified into analog, digital and mixed signal, consisting of both analog and digital signaling on the same IC. Among the most advanced integrated circuits are the microprocessors or "cores", which control everything from personal computers and cellular phones to digital microwave ovens. Digital memory chips and application-specific integrated circuits (ASICs) are examples of other families of integrated circuits that are important to the modern information society. In the 1980s, programmable logic devices were developed. These devices contain circuits whose logical function and connectivity can be programmed by the user, rather than being fixed by the integrated circuit manufacturer. This allows a single chip to be programmed to implement different LSI-type functions such as logic gates, adders and registers. Current devices called field-programmable gate arrays (FPGAs) can (as of 2016) implement the equivalent of millions of gates and operate at frequencies up to 1 GHz. Analog ICs, such as sensors, power management circuits, and operational amplifiers (op-amps), work by processing continuous signals. They perform functions like amplification, active filtering, demodulation, and mixing. Analog ICs ease the burden on circuit designers by having expertly designed analog circuits available instead of designing a difficult analog circuit from scratch. ICs can also combine analog and digital circuits on a single chip to create functions such as analog-to-digital converters and digital-to-analog converters. Such mixed-signal circuits offer smaller size and lower cost, but must carefully account for signal interference. Prior to the late 1990s, radios could not be fabricated in the same low-cost CMOS processes as microprocessors. But since 1998, a large number of radio chips have been developed using CMOS processes. Examples include Intel's DECT cordless phone, or 802.11 (Wi-Fi) chips created by Atheros and other companies. Analog ICs are further sub-categorized as linear ICs and radio frequency (RF) ICs. Rendering of a small standard cell with three metal layers (dielectric has been removed). The sand-colored structures are metal interconnect, with the vertical pillars being contacts, typically plugs of tungsten. The reddish structures are polysilicon gates, and the solid at the bottom is the crystalline silicon bulk. Schematic structure of a CMOS chip, as built in the early 2000s. The graphic shows LDD-MISFET's on an SOI substrate with five metallization layers and solder bump for flip-chip bonding. It also shows the section for FEOL (front-end of line), BEOL (back-end of line) and first parts of back-end process. The semiconductors of the periodic table of the chemical elements were identified as the most likely materials for a solid-state vacuum tube. Starting with copper oxide, proceeding to germanium, then silicon, the materials were systematically studied in the 1940s and 1950s. Today, monocrystalline silicon is the main substrate used for ICs although some III-V compounds of the periodic table such as gallium arsenide are used for specialized applications like LEDs, lasers, solar cells and the highest-speed integrated circuits. It took decades to perfect methods of creating crystals with minimal defects in semiconducting materials' crystal structure. Semiconductor ICs are fabricated in a planar process which includes three key process steps – photolithography, deposition (such as chemical vapor deposition), and etching. The main process steps are supplemented by doping and cleaning. Mono-crystal silicon wafers are used in most applications (or for special applications, other semiconductors such as gallium arsenide are used). The wafer need not be entirely silicon. Photolithography is used to mark different areas of the substrate to be doped or to have polysilicon, insulators or metal (typically aluminium or copper) tracks deposited on them. Dopants are impurities intentionally introduced to a semiconductor to modulate its electronic properties. Doping is the process of adding dopants to a semiconductor material. Integrated circuits are composed of many overlapping layers, each defined by photolithography, and normally shown in different colors. Some layers mark where various dopants are diffused into the substrate (called diffusion layers), some define where additional ions are implanted (implant layers), some define the conductors (doped polysilicon or metal layers), and some define the connections between the conducting layers (via or contact layers). All components are constructed from a specific combination of these layers. Since a CMOS device only draws current on the transition between logic states, CMOS devices consume much less current than bipolar junction transistor devices. A random-access memory is the most regular type of integrated circuit; the highest density devices are thus memories; but even a microprocessor will have memory on the chip. (See the regular array structure at the bottom of the first image.[which?]) Although the structures are intricate – with widths which have been shrinking for decades – the layers remain much thinner than the device widths. The layers of material are fabricated much like a photographic process, although light waves in the visible spectrum cannot be used to "expose" a layer of material, as they would be too large for the features. Thus photons of higher frequencies (typically ultraviolet) are used to create the patterns for each layer. Because each feature is so small, electron microscopes are essential tools for a process engineer who might be debugging a fabrication process. Each device is tested before packaging using automated test equipment (ATE), in a process known as wafer testing, or wafer probing. The wafer is then cut into rectangular blocks, each of which is called a die. Each good die (plural dice, dies, or die) is then connected into a package using aluminium (or gold) bond wires which are thermosonically bonded to pads, usually found around the edge of the die. Thermosonic bonding was first introduced by A. Coucoulas which provided a reliable means of forming these vital electrical connections to the outside world. After packaging, the devices go through final testing on the same or similar ATE used during wafer probing. Industrial CT scanning can also be used. Test cost can account for over 25% of the cost of fabrication on lower-cost products, but can be negligible on low-yielding, larger, or higher-cost devices. Copper interconnects where copper wiring replaces aluminum for interconnects. Intel transitioned away from PGA to land grid array (LGA) and BGA beginning in 2004, with the last PGA socket released in 2014 for mobile platforms. As of 2018[update], AMD uses PGA packages on mainstream desktop processors, BGA packages on mobile processors, and high-end desktop and server microprocessors use LGA packages. Electrical signals leaving the die must pass through the material electrically connecting the die to the package, through the conductive traces (paths) in the package, through the leads connecting the package to the conductive traces on the printed circuit board. The materials and structures used in the path these electrical signals must travel have very different electrical properties, compared to those that travel to different parts of the same die. As a result, they require special design techniques to ensure the signals are not corrupted, and much more electric power than signals confined to the die itself. When multiple dies are put in one package, the result is a system in package, abbreviated SiP. A multi-chip module (MCM), is created by combining multiple dies on a small substrate often made of ceramic. The distinction between a large MCM and a small printed circuit board is sometimes fuzzy. Packaged integrated circuits are usually large enough to include identifying information. Four common sections are the manufacturer's name or logo, the part number, a part production batch number and serial number, and a four-digit date-code to identify when the chip was manufactured. Extremely small surface-mount technology parts often bear only a number used in a manufacturer's lookup table to find the integrated circuit's characteristics. Future developments seem to follow the multi-core multi-microprocessor paradigm, already used by Intel and AMD multi-core processors. Rapport Inc. and IBM started shipping the KC256 in 2006, a 256-core microprocessor. Intel, as recently as February–August 2011, unveiled a prototype, "not for commercial sale" chip that bears 80 cores. Each core is capable of handling its own task independently of the others. This is in response to heat-versus-speed limit, that is about to be reached[when?] using existing transistor technology (see: thermal design power). This design provides a new challenge to chip programming. Parallel programming languages such as the open-source X10 programming language are designed to assist with this task. SSI circuits were crucial to early aerospace projects, and aerospace projects helped inspire development of the technology. Both the Minuteman missile and Apollo program needed lightweight digital computers for their inertial guidance systems. Although the Apollo guidance computer led and motivated integrated-circuit technology, it was the Minuteman missile that forced it into mass-production. The Minuteman missile program and various other United States Navy programs accounted for the total $4 million integrated circuit market in 1962, and by 1968, U.S. Government spending on space and defense still accounted for 37% of the $312 million total production. The demand by the U.S. Government supported the nascent integrated circuit market until costs fell enough to allow IC firms to penetrate the industrial market and eventually the consumer market. The average price per integrated circuit dropped from $50.00 in 1962 to $2.33 in 1968. Integrated circuits began to appear in consumer products by the turn of the 1970s decade. A typical application was FM inter-carrier sound processing in television receivers. In 1964, Frank Wanlass demonstrated a single-chip 16-bit shift register he designed, with a then-incredible 120 transistors on a single chip. MSI devices were attractive economically because while they cost a little more to produce than SSI devices, they allowed more complex systems to be produced using smaller circuit boards, less assembly work because of fewer separate components, and a number of other advantages. The masks used to process and manufacture SSI, MSI and early LSI and VLSI devices (such as the microprocessors of the early 1970s) were mostly created by hand, often using Rubylith-tape or similar. For large or complex ICs (such as memories or processors), this was often done by specially hired professionals in charge of circuit layout, placed under the supervision of a team of engineers, who would also, along with the circuit designers, inspect and verify the correctness and completeness of each mask. The final step in the development process, starting in the 1980s and continuing through the present, was "very-large-scale integration" (VLSI). The development started with hundreds of thousands of transistors in the early 1980s, As of 2016[update], transistor counts continue to grow beyond ten billion transistors per chip. Multiple developments were required to achieve this increased density. Manufacturers moved to smaller design rules and cleaner fabrication facilities so that they could make chips with more transistors and maintain adequate yield. The path of process improvements was summarized by the International Technology Roadmap for Semiconductors (ITRS), which has since been succeeded by the International Roadmap for Devices and Systems (IRDS). Electronic design tools improved enough to make it practical to finish these designs in a reasonable time. The more energy-efficient CMOS replaced NMOS and PMOS, avoiding a prohibitive increase in power consumption. 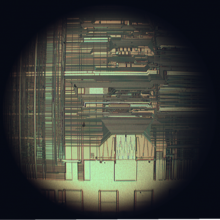 Modern VLSI devices contain so many transistors, layers, interconnections, and other features that it is no longer feasible to check the masks or do the original design by hand. Instead, engineers use EDA tools to perform most functional verification work. In 1986 the first one-megabit random-access memory (RAM) chips were introduced, containing more than one million transistors. Microprocessor chips passed the million-transistor mark in 1989 and the billion-transistor mark in 2005. The trend continues largely unabated, with chips introduced in 2007 containing tens of billions of memory transistors. A system-on-a-chip (SoC or SOC) is an integrated circuit in which all the components needed for a computer or other system are included on a single chip. The design of such a device can be complex and costly, and building disparate components on a single piece of silicon may compromise the efficiency of some elements. [needs update?] However, these drawbacks are offset by lower manufacturing and assembly costs and by a greatly reduced power budget: because signals among the components are kept on-die, much less power is required (see Packaging). Further, signal sources and destinations are physically closer on die, reducing the length of wiring and therefore latency, transmission power costs and waste heat from communication between modules on the same chip. This has led to an exploration of so-called Network-on-Chip (NoC) devices, which apply system-on-chip design methodologies to digital communication networks as opposed to traditional bus architectures. ^ "Integrated circuit (IC)". JEDEC. ^ Andrew Wylie (2009). "The first monolithic integrated circuits". Retrieved 14 March 2011. Nowadays when people say 'integrated circuit' they usually mean a monolithic IC, where the entire circuit is constructed in a single piece of silicon. ^ Horowitz, Paul; Hill, Winfield (1989). The Art of Electronics (2nd ed.). Cambridge University Press. p. 61. ISBN 978-0-521-37095-0. Integrated circuits, which have largely replaced circuits constructed from discrete transistors, are themselves merely arrays of transistors and other components built from a single chip of semiconductor material. ^ "Integrated circuits help Invention". Integratedcircuithelp.com. Retrieved 13 August 2012. ^ ‹See Tfd›DE 833366 W. Jacobi/SIEMENS AG: "Halbleiterverstärker" priority filing on 14 April 1949, published on 15 May 1952. ^ Rostky, George. "Micromodules: the ultimate package". EE Times. Archived from the original on 7 January 2010. Retrieved 23 April 2018. ^ "The RCA Micromodule". Vintage Computer Chip Collectibles, Memorabilia & Jewelry. Retrieved 23 April 2018. ^ Dummer, G.W.A. ; Robertson, J. Mackenzie (16 May 2014). American Microelectronics Data Annual 1964–65. Elsevier. pp. 392–397, 405–406. ISBN 978-1-4831-8549-1. ^ Winston, Brian (1998). Media Technology and Society: A History: From the Telegraph to the Internet. Routledge. p. 221. ISBN 978-0-415-14230-4. ^ "Texas Instruments – 1961 First IC-based computer". Ti.com. Retrieved 13 August 2012. ^ "Milestones:First Semiconductor Integrated Circuit (IC), 1958". IEEE Global History Network. IEEE. Retrieved 3 August 2011. ^ Kurt Lehovec's patent on the isolation p–n junction: U.S. Patent 3,029,366 granted on 10 April 1962, filed 22 April 1959. Robert Noyce credits Lehovec in his article – "Microelectronics", Scientific American, September 1977, Volume 23, Number 3, pp. 63–69. ^ "Qualcomm and Samsung Collaborate on 10nm Process Technology for the Latest Snapdragon 835 Mobile Processor". news.samsung.com. Retrieved 11 February 2017. ^ a b "Inside Pascal: NVIDIA's Newest Computing Platform". 5 April 2016. . 15,300,000,000 transistors in 610 mm2. ^ "International Roadmap for Devices and Systems" (PDF). IEEE. 2016. ^ H. Fujita (1997). A decade of MEMS and its future. Tenth Annual International Workshop on Micro Electro Mechanical Systems. ^ A. Narasimha; et al. (2008). "A 40-Gb/s QSFP optoelectronic transceiver in a 0.13 µm CMOS silicon-on-insulator technology". Proceedings of the Optical Fiber Communication Conference (OFC): OMK7. ^ M. Birkholz; A. Mai; C. Wenger; C. Meliani; R. Scholz (2016). "Technology modules from micro- and nano-electronics for the life sciences". WIREs Nanomed. Nanobiotech. 8 (3): 355–377. doi:10.1002/wnan.1367. PMID 26391194. ^ A.H.D. Graham; J. Robbins; C.R. Bowen; J. Taylor (2011). "Commercialisation of CMOS Integrated Circuit Technology in Multi-Electrode Arrays for Neuroscience and Cell-Based Biosensors". Sensors. 11 (5): 4943–4971. doi:10.3390/s110504943. PMC 3231360. PMID 22163884. ^ Zvi Or-Bach. "Why SOI is the Future Technology of Semiconductors". 2013. ^ "Samsung’s Eight-Stack Flash Shows up in Apple’s iPhone 4". 2010. ^ "Spherical semiconductor radio temperature sensor". NatureInterface. 2002. ^ Mark LaPedus (16 April 2015). "FinFET Rollout Slower Than Expected". Semiconductor Engineering. ^ "About the EDA Industry". Electronic Design Automation Consortium. Archived from the original on 2 August 2015. Retrieved 29 July 2015. ^ Paul R. Gray; Paul J. Hurst; Stephen H. Lewis; Robert G. Meyer (2009). Analysis and Design of Analog Integrated Circuits. Wiley. ISBN 978-0-470-24599-6. ^ Jan M. Rabaey; Anantha Chandrakasan; Borivoje Nikolic (2003). Digital Integrated Circuits (2nd Edition). Pearson. ISBN 978-0-13-090996-1. ^ Jacob Baker (2008). CMOS: Mixed-Signal Circuit Design. Wiley. ISBN 978-0-470-29026-2. ^ "CD4068 data sheet" (PDF). Intersil. ^ "Stratix 10 Device Overview" (PDF). Altera. 12 December 2015. Retrieved 18 November 2016. ^ Nathawad, L.; Zargari, M.; Samavati, H.; Mehta, S.; Kheirkhaki, A.; Chen, P.; Gong, K.; Vakili-Amini, B.; Hwang, J.; Chen, M.; Terrovitis, M.; Kaczynski, B.; Limotyrakis, S.; Mack, M.; Gan, H.; Lee, M.; Abdollahi-Alibeik, B.; Baytekin, B.; Onodera, K.; Mendis, S.; Chang, A.; Jen, S.; Su, D.; Wooley, B. "20.2: A Dual-band CMOS MIMO Radio SoC for IEEE 802.11n Wireless LAN" (PDF). IEEE Entity Web Hosting. IEEE. Retrieved 22 October 2016. ^ Max Chafkin; Ian King (9 June 2016). "How Intel Makes a Chip". Bloomburg Businessweek. ^ Mark Lapedus (21 May 2015). "10 nm Fab Watch". Semiconductor Engineering. ^ "145 series ICs (in Russian)". Retrieved 22 April 2012. ^ Moammer, Khalid (16 September 2016). "AMD Zen CPU & AM4 Socket Pictured, Launching February 2017 – PGA Design With 1331 Pins Confirmed". Wccftech. Retrieved 20 May 2018. ^ "Ryzen 5 2500U – AMD – WikiChip". Retrieved 20 May 2018. ^ "AMD's 'TR4' Threadripper CPU socket is gigantic". PCWorld. Retrieved 20 May 2018. ^ "Federal Statutory Protection for Mask Works" (PDF). United States Copyright Office. United States Copyright Office. Retrieved 22 October 2016. ^ On Jan. 1, 1995, the Agreement on Trade-Related Aspects of Intellectual Property Rights (TRIPs) (Annex 1C to the World Trade Organization (WTO) Agreement), went into force. Part II, section 6 of TRIPs protects semiconductor chip products and was the basis for Presidential Proclamation No. 6780, March 23, 1995, under SCPA § 902(a)(2), extending protection to all present and future WTO members. ^ Japan was the first country to enact its own version of the SCPA, the Japanese "Act Concerning the Circuit Layout of a Semiconductor Integrated Circuit" of 1985. ^ In 1986 the EC promulgated a directive requiring its members to adopt national legislation for the protection of semiconductor topographies. Council Directive 1987/54/EEC of 16 Dec. 1986 on the Legal Protection of Topographies of Semiconductor Products, art. 1(1)(b), 1987 O.J. (L 24) 36. ^ Bulletin de la Societe fribourgeoise des sciences naturelles, Volumes 62 à 63 (in French). 1973. ^ Safir, Ruben (March 2015). "System On Chip - Integrated Circuits". NYLXS Journal. ISBN 9781312995512. ^ Mindell, David A. (2008). Digital Apollo: Human and Machine in Spaceflight. The MIT Press. ISBN 978-0-262-13497-2. ^ Ginzberg, Eli (1976). Economic impact of large public programs: the NASA Experience. Olympus Publishing Company. p. 57. ISBN 978-0-913420-68-3. ^ a b Bob Johnstone (1999). We were burning: Japanese entrepreneurs and the forging of the electronic age. Basic Books. pp. 47–48. ISBN 978-0-465-09118-8. ^ Lee Boysel (12 October 2007). "Making Your First Million (and other tips for aspiring entrepreneurs)". U. Mich. EECS Presentation / ECE Recordings. ^ "Intel's Accidental Revolution". CNET. ^ C.F. O'Donnell. "Engineering for systems using large scale integration". p. 870. ^ Meindl, J.D. (1984). "Ultra-large scale integration". IEEE Transactions on Electron Devices. 31 (11): 1555–1561. doi:10.1109/T-ED.1984.21752. Retrieved 21 September 2014. ^ Shanefield, Daniel. "Wafer scale integration". google.com/patents. Retrieved 21 September 2014. ^ Klaas, Jeff. "System-on-a-chip". google.com/patents. Retrieved 21 September 2014. ^ Topol, A.W. ; Tulipe, D.C.La; Shi, L; et., al (2006). "Three-dimensional integrated circuits". IBM Journal of Research and Development. 50 (4.5): 491–506. doi:10.1147/rd.504.0491. Veendrick, H.J.M. (2017). Nanometer CMOS ICs, from Basics to ASICs. Springer. ISBN 978-3-319-47595-0. Baker, R.J. (2010). CMOS: Circuit Design, Layout, and Simulation (3rd ed.). Wiley-IEEE. ISBN 978-0-470-88132-3. Rabaey, J.M. ; Chandrakasan, A.; Nikolic, B. (2003). Digital Integrated Circuits (2nd ed.). Pearson. ISBN 978-0-13-090996-1.